Tyler Coulson walked across America in 2011. Just recently, he published a book about his adventures. 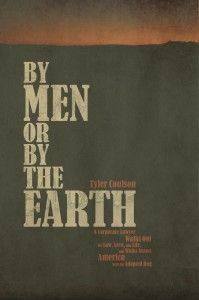 Tyler’s book. You know you want it! I bought the e-book, and I have to say I was NOT disappointed. Tyler weaves together three different narratives seamlessly: the walk itself, the events leading up to the walk, and after he finished. Getting into his head space was fascinating. Tyler is a badass! On the trip, which took less than one year, he suffered a broken finger and a closed black eye practically out of the gate, and as his trip progressed a sprained/possibly broken ankle, lacerated feet, rattlesnakes, a pissed off bear, dog attacks, nasty storms, horrid heat, and more character building events than most people live through in a lifetime. Go buy the book. Seriously. It makes me want to walk the continent more than ever. I’m inspired and more than a little intimidated. Which makes me want to do it even more, lol. For an e-book copy at Amazon click here. For a paperback copy at Amazon click here. To check out his fascinating blog, click here. To read the article that the San Francisco Chronicle wrote up about him, click here. Oh, and one last thing–10% sales of his book until Dec. 31 will go to no-kill animal shelters! So when you buy your copy, you’ll be helping out our four-legged friends! Oh, yes–the bear episode is truly skin-crawling. I hope you get a chance to read it!